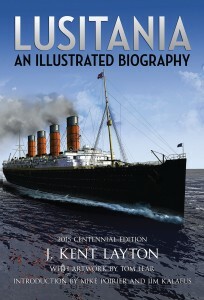 In December 2010, Amberley Books released my volume entitled Lusitania: An Illustrated Biography. The book was groundbreaking because it focused on more than just the sinking and successive political ramifications from that event. Instead, it focused on an oft-overlooked aspect of the ship: on her brilliant 7 1/2-year career, and on the details of her technical design. It also included a chapter on the ship’s career during the war, and on the sinking and its aftermath – yet keeping these events all in proper context. In short, it told the ship’s story from start to finish. How could the text be improved or expanded? What new photographic or illustrative material could be brought in? Where could lower-quality images from the first edition be reduced in size, and better or rarer images displayed in large format? All of these questions led to a thorough revamp of the entire book. New artwork, photographs and illustrations have been included in order to help add to the treasure trove of illustrative material from the first edition. The layout has been entirely re-worked, in order to showcase the rarest, clearest and most spectacular pieces. Meanwhile, the original plans of the ship, which I drew for the original volume, have been increased in size from their previous 8.25″ length up to 12.5″. The page size now matches the second editions of On A Sea of Glass: The Life & Loss of the RMS Titanic and The Edwardian Superliners: A Trio of Trios; the number of pages has increased from 424 to 448. The 479 photographs and illustrations from the original volume has increased to 495. An additional colour section, comprised of 16 pages, adds to the 448 pages of the rest of the book; whereas the original edition’s colour section contained 27 photos and illustrations, the colour section in the new edition has 33, including some artwork contributed by noted maritime artist Stuart Williamson, to help supplement Tom Lear’s splendid original pieces which were produced specifically for the 2010 edition. The splendid introduction by Mike Poirier and Jim Kalafus, as well as the survivor’s note by Barbara Anderson McDermott, have been retained. I have also penned a special “Centennial Note” to add to the book’s opening pages. The six informational appendices have also been retained. The entire text of the volume has been revised, corrected, and even expanded to include new and fascinating information regarding the liner. In short, although everything good about the 2010 volume has been retained, the whole book has a new, fresh feel. 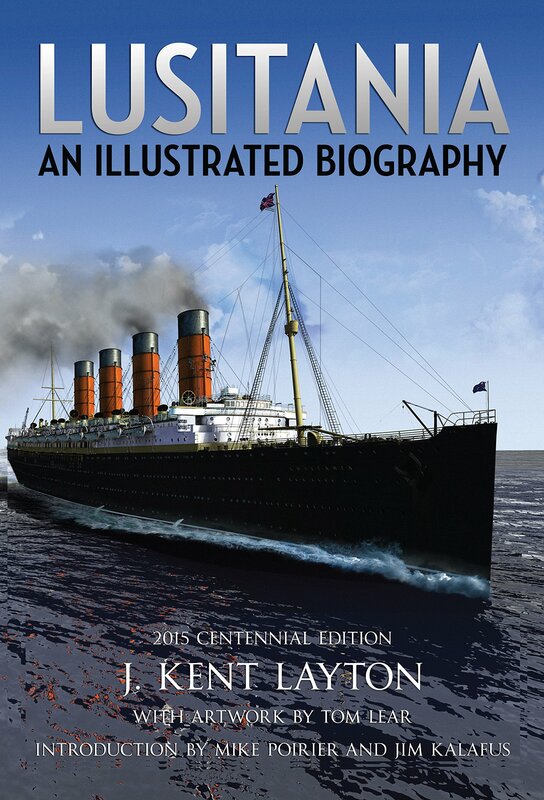 Lusitania: An Illustrated Biography was released in the UK on March 15, 2015, and in the United States and Americas on May 19, 2015. The publisher made special arrangements with me to obtain advance stock before the US release so that I could make them available in time for the centennial events, but orders were so strong that my own supply has been exhausted. Whether you enjoyed the 2010 edition, or did not have the opportunity to acquire that volume, make sure to get this book. I hope very much that it will be a fitting tribute to those whose lives were touched by the Lusitania, both in life and in death. Have a look at these preview pages from the new Centennial Edition of Lusitania: An Illustrated Biography. Click each thumbnail to enlarge. Get all of the latest news and updates on Lusitania: An Illustrated Biography through the book’s official Facebook page. Note: This web site, including the name “Atlantic Liners” and all of the site’s contents, are ©2004-2015 by J. Kent Layton. This site is built and maintained by TMB Studios.